I assume nobody is reading this space of mine anymore. That’s okay. It is all about the microblogging and social medias now isn’t it? Well, not for me it’s not. Not this year anyway. I’ve cut down on Facebook – curating my feeds to only contain positive and value adding updates, keeping only the joy-sparking stuff, to borrow a line from Marie Kondo’s famous book. I have deleted Dayre from my phone (one of my favourite apps) because I want to consume with intent. “Consume with intent” – that’s the magic phrase, isn’t it? I am trying to pick up the pieces of my life and mindlessly reading about 100 other people’s daily happenings whether good or bad isn’t really going to help, is it? I have kept Instagram though, because I can curate what I want to see on my feed – it’s now filled with crafts, beautiful things and sewing stuff. So after all that, here I am. With my old blog. I am back here because I realise now with this space I don’t have to consume anything mindlessly, cause it’s all mine! I can share without fear of being inundated with for lack of better words, #firstworldproblems that frankly aren’t really amusing or interesting to me anymore. Not to say I’ve lost my sense of humour (maybe I have), but maybe my patience for non-issues have depleted so significantly that I’ve chosen to just not be in their paths. It’s rather difficult to articulate what’s happening to me and Gareth but suffice to say that the loss of our babies last September has brought a (long time coming in fact) change to us. Since it happened, we have been seeking ways to fill up the voids which means we have been occupying our time with Liam and various hobbies. We have also been somewhat obsessed with achieving our authentic lives – intellectually, physically and spiritually. Gareth has since lost over 20kgs, I am so proud of him. January hasn’t even ended and I’ve read 3 books. That’s 3 more than in the past few years put together! I am sewing more, painting more and currently trying to pick up yoga (thank you Youtube). Pity that it took a tragedy to get us finally moving our butts but unfortunately that is what it took. Call these shifts a distraction for the mind if you’re cynical or silver linings if you’re a romantic but for us they are what feels right, right now. Anyway, I think I will be writing here a lot more, mostly about Liam of course because I’m not done with documenting his developments. Updates will be sporadic and casual unless I have something proper to share like a recipe, travel post or something. Thanks nobody for reading. It’s only appropriate to end this update with a picture of my son quietly playing with his trains while I was writing this. 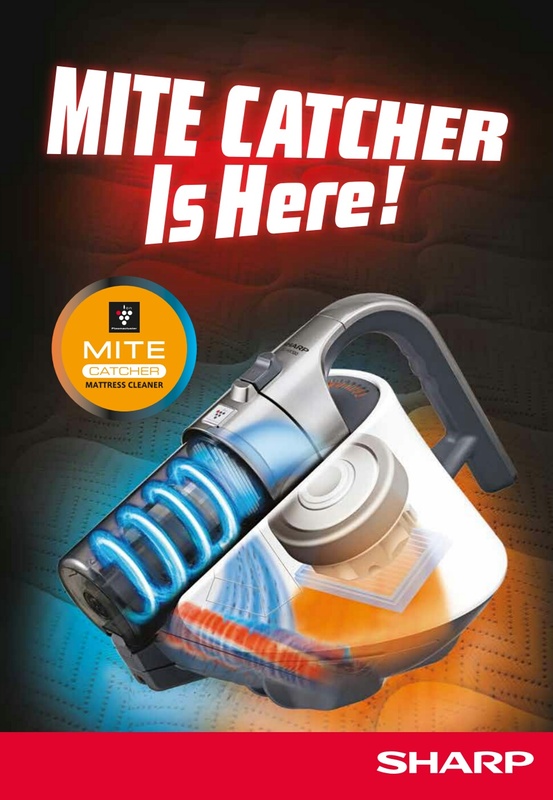 I am going to the launch of this Sharp product called The Mite Catcher. Having a baby now means hygiene is incredibly important and what’s more horrifying than creepy crawly bed mites? Ewwwwwww! Can’t wait to see what this baby can do! 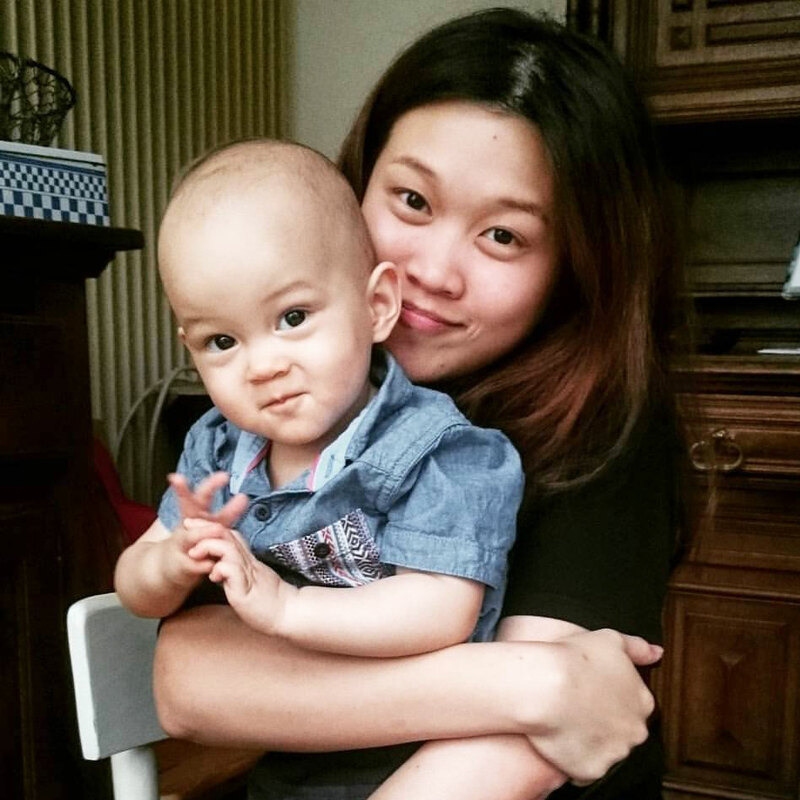 Keeping Liam from getting bitten by mosquitoes is one of my main struggles as a new parent. News of rising dengue cases are really scary. In fact my own brother was admitted for dengue a couple of months ago :( So glad he’s recovered. It doesn’t help matter that I do take Liam along for my dog walking sessions daily in a nearby park where mossies thrive! 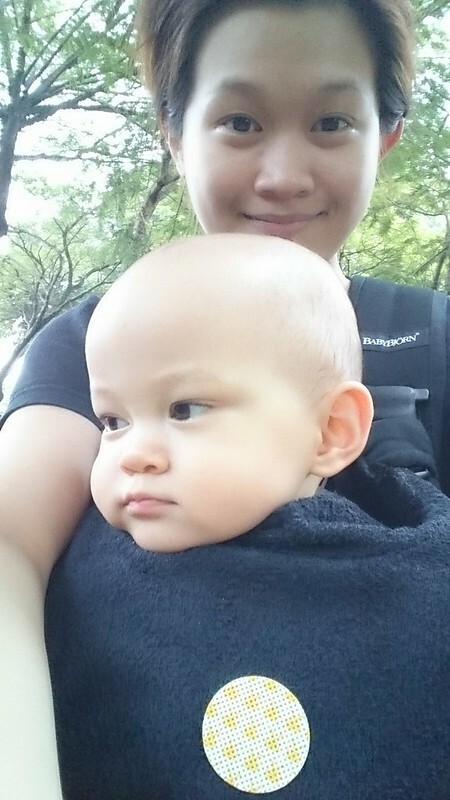 Thing is, while I could use powerful mosquito repellant on myself, I can’t do so for Liam as he’s just a baby with delicate skin. Lets not even begin on the risks of his skin developing allergies. 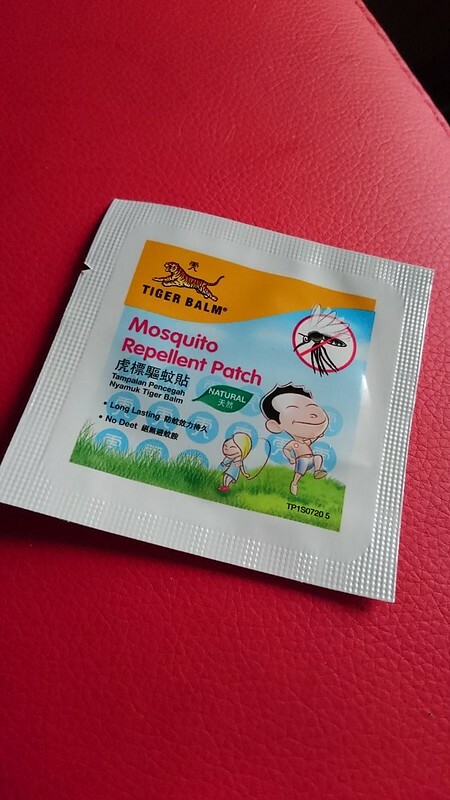 There are plenty of products out there in the market for babies and kids but my favourite currently is from the trusted brand name, Tiger Balm. 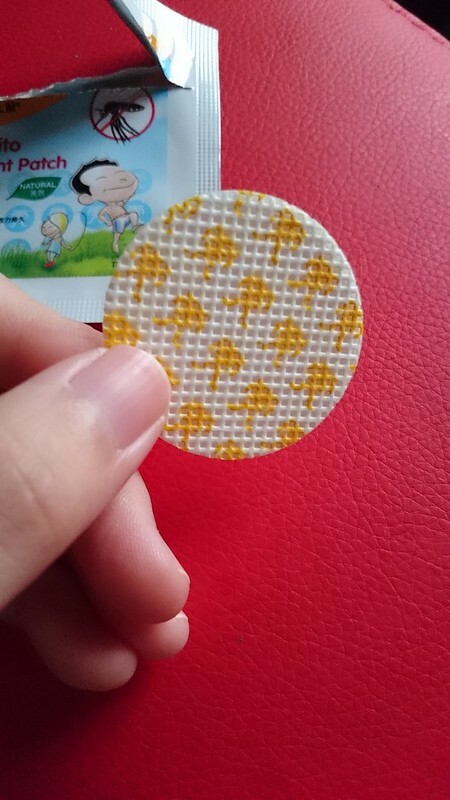 Coming in packs of 10s, each patch is individually packed to ensure its efficacy. 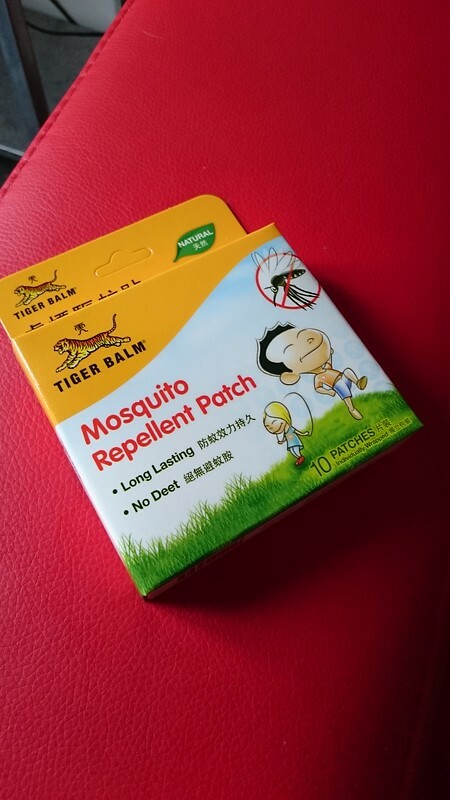 I love that the patches have only natural active ingredients and no scary chemicals such as DEET. It’s very easy to use. Just open the packet, take the patch out and peel off the back layer and stick it on clothes, prams/strollers or baby carriers. It’s sufficiently sticky and works best on fabric material. No worries about it leaving sticky residue, not on my stuff anyway. I use the patches on our walks, sticking one to Liam’s baby carrier. I swear it keeps both of us from mossie bites. There’s no need for skin contact, a huge plus. 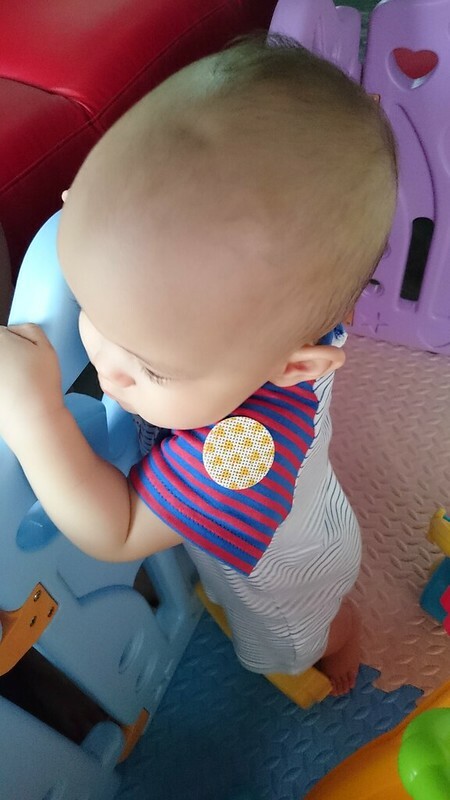 I also stick the patches on Liam’s clothes when he’s playing in his play yard, which is located in the corner of the living room, a favourite hangout place for nasty mosquitoes. And of course, Liam has been mossie bites free since I started using the patches. 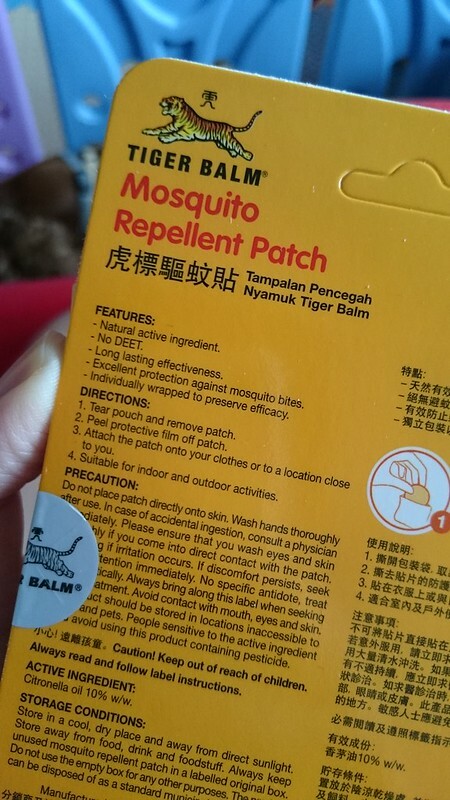 That to me, is the biggest reason why I love Tiger Balm’s Mosquito Repellent Patch.